The aim of the book is to teach jQuery in an intensely hands-on way. It succeeds in this and probably provides the fastest way to learn and master the framework." To begin, chapter 7 presents the jQuery selectors, methods, and event methods that you’ll use most often. Then, the next four chapters build on that base as they focus on effects and animations, DOM manipulation and traversal, forms and data validation, the many plugins that are available for jQuery, and how to create your own plugins. When you complete this section, you can go on to any of the 3 sections that follow. Besides the core jQuery library, jQuery provides the jQuery UI (User Interface) library. This library helps you build features that your site visitors may appreciate, all with just a few lines of code. So this section shows you how to use jQuery UI to create widgets like tabs, accordions, and datepickers...interactions like draggable, droppable, and sortable...and effects like color and class transitions. Ajax and JSON are hot topics today. Together, they can be used to get data from a server and add it to a web page without reloading the entire page, which can significantly improve response times for users (if you’ve ever scrolled around a Google Map, you’ve seen this in action). But to be honest, the coding can be mind-bending. Fortunately, jQuery provides methods that make it far more manageable. basics. Then, you’ll learn how to work with the APIs for websites like Blogger, YouTube, Twitter, Flickr, and Google Maps to add popular content to your pages. This is a major use of Ajax and JSON…yet no other jQuery book shows you how to do it. The only prerequisite is a basic familiarity with HTML and CSS. We don’t expect you to code HTML and CSS, though, so we provide that code for all of the examples and exercises in the book. 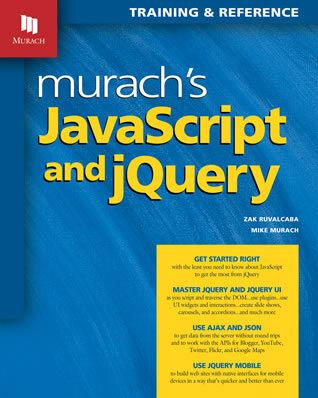 Then, when you’re ready to learn more, you can get Murach’s HTML5 and CSS3. To test a web page, you can use the default browser on your system. But we recommend that you also test your pages in Mozilla Firefox, which includes a terrific debugging tool called Firebug. In practice, you should also test your pages in Opera and Chrome, or in any other browser that your website visitors are likely to use, but that isn’t necessary as you learn. Again, all of these browsers are available for free. To help you install these products, Appendix A provides the procedures that you’ll need. In addition, chapter 1 presents a short tutorial on using Aptana, and chapter 4 shows you how to use Firebug for debugging pages that are rendered in Firefox. Appendix A in the book shows how to install and use these files on Windows and Mac systems.